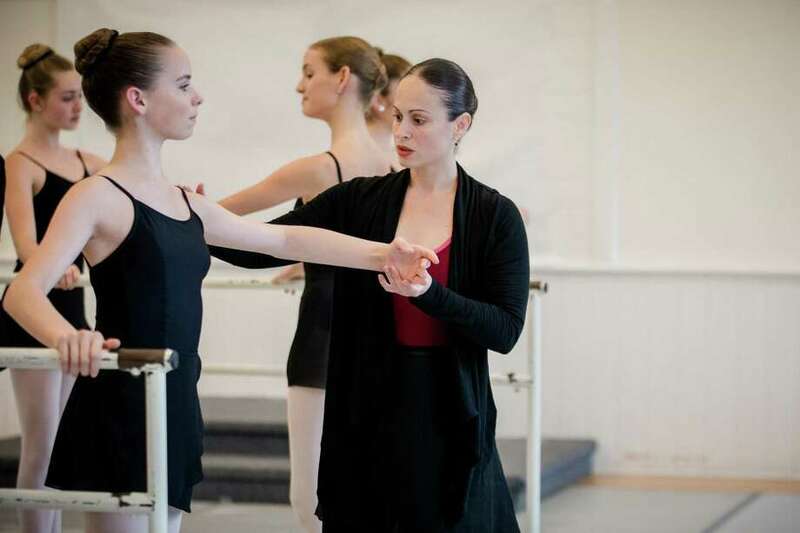 One of the directors at New England Academy of Dance in New Canaan, Ginna Ortiz has danced since age six. NEW CANAAN — From Puerto Rico to Florida to New York and now Connecticut, Ginna Ortiz, 45, owes much of her travels to her passion for dance. Ortiz, who resides in Pound Ridge, New York, has devoted her life to dance since the early age of six along with her twin sister, Frances. The Ortiz sisters are currently directors and owners of the New England Academy of Dance. Ginna talks about her experiences and trajectory spanning back to Puerto Rico. Q: How did dance begin for you in Puerto Rico? A: Our parents introduced us to dance classes at the age of 6. It was a mix of ballet along with other more traditional Puerto Rican dances. Right from the beginning Frances and I fell in love with dance. Our mom says that our dream was always to become dancers in New York City, teach and someday own our own school. Q: Do you go back to Puerto Rico often? A: We go back occasionally for vacation and to visit family. The rainforest, the forts, the beaches, the food and culture are still so deeply ingrained in us. Q: Was your family, if any, affected by the hurricane earlier this year? A: Hurricane Maria devastated Puerto Rico. It was heartbreaking for us. We have dozens of family members there who lost power, had their homes damaged, and have had to revert to old-fashioned ways of everyday life. Some family members left the island and went to Florida or New York. It’s hard to believe that even today the electricity hasn’t been fully restored. I think it’s easy to forget that people in Puerto Rico are American citizens. We tried to help out by running a dance fundraiser at New England Academy of Dance. The local community really came together and we were proud to raise and donate over $2,500 to aid hurricane victims. Q: How did you make the jump to Miami for dance? A: Our family moved from Puerto Rico to Orlando, Florida when Frances and I were 11. Our parents wanted a better education for us. It was often a struggle for them to afford our dance classes, but we were extremely fortunate to receive scholarships from our early schools. If it weren’t for the generosity and support of those teachers and studios, we would never have been able to continue as dancers. That’s something we appreciate every day, and we try to give back now by offering scholarships to attend New England Academy of Dance for students who couldn’t otherwise afford it. Our freshman year of high school, Frances and I were accepted into the New World School of the Arts in Miami. It’s an elite public high school dedicated to the performing arts. Our family relocated from Orlando to Miami so we could pursue our dreams. That was the game changer that put us on the path toward a career in dance. Q: And from Miami to Purchase? A: If you want to be a dancer you have to go to New York! We wanted to be near New York City and get our college degrees, so we chose State University of New York-Purchase College, which has one of the best dance programs in the country and offered us great scholarships. Purchase College is where Frances met her now husband, Ted Thomas, who danced professionally for many years with Paul Taylor and other renowned companies. Today, Ted is a key part of running New England Academy of Dance along with Frances and myself. We remain close with the dance faculty at Purchase and bring them in to teach master classes at the Academy and advise us on our productions. Q: How was your experience with the Dance Theater of Harlem? A: After graduating from Purchase, I moved to New York City to audition for dance companies and eventually made it into Dance Theater of Harlem, which at the time was one of the premiere ballet companies in New York. My time there was magical and unforgettable. I loved being onstage and traveling around the world with a group of exceptional artists. Dance Theater of Harlem is a largely African American and Hispanic company, which was unusual in the country at that time. I personally had been involved with other ballet programs where they told me my skin was too dark to be a ballerina, so for me, the celebration of cultural and ethnic diversity at Dance Theater of Harlem was very special. These days people forget that Misty Copeland is not the first great black ballerina - there were many more before her, and I had the pleasure of dancing alongside them! Q: How did you come across the New England Academy of Dance? A: Around 1996, while I was dancing with Dance Theater of Harlem, I was hired to perform leading roles in the New England Academy of Dance Nutcracker in New Canaan. The local school had been run for nearly 30 years by Doris Driver. I still remember taking the train from New York City to New Canaan and seeing the town for the first time. It seemed like something out of a magical New England fairy tale! Doris soon hired me part-time as an instructor to teach ballet classes. Meanwhile, Frances and Ted completed master’s degrees in Dance Education at New York University, and they began coming up to New Canaan to teach as well as perform. Doris Driver’s dream was always to bring extraordinary, New York City-level dance training to New Canaan. We worked closely with her to develop a high-end program and were able to double the number of students within a few years. When she was ready to retire, in 2003, we became the owners of the school and are honored to carry on the legacy that she created in this community. Q: What has been the most unique experience for you? A: As a little girl in Puerto Rico I dreamed of performing the great ballets on grand stages around the World. But I also dreamed of being a teacher and inspiring others. I often can’t believe how fortunate I’ve been to achieve both! Dancing George Balanchine’s Serenade at the Kennedy Center is a moment I’ll never forget. But I get just as much joy and satisfaction almost every day from teaching at our school. It gives me a profound sense of purpose to know that I’m making a difference in young people’s lives. Q: Lastly, what does dance mean to you? A: Dance is one of the great art forms, with the ability to inspire and bring imagination to life. For me personally, it has been a vehicle to become my best self. Through hard work, discipline, and personal expression, dance gives us an artistic voice and a way to explore our personal limits. We believe passionately that the arts should be available to everybody! Our non-profit organization, New England Dance Theater, accepts donations toward our scholarship fund and other community outreach programs.